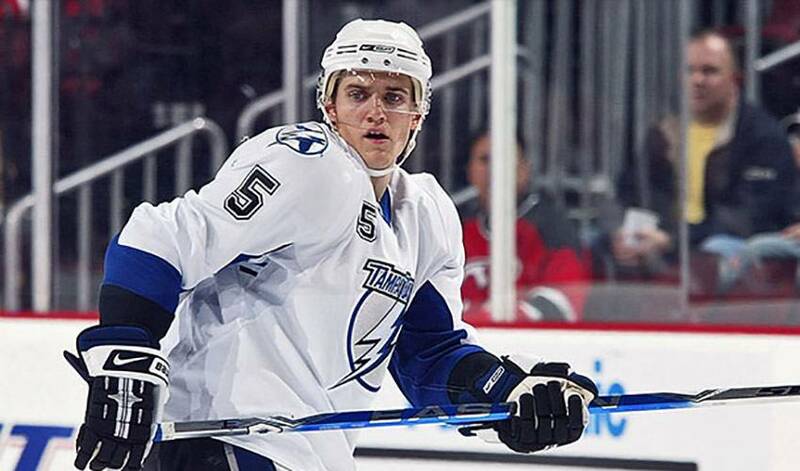 He made the big-screen scene with a small part in the movie 'This Is 40,' but Matt Carle is hoping to play a larger role as a member of the Tampa Bay Lightning. "No, I don't think George Clooney has anything to worry about," joked Carle, in reference to his own acting debut, a brief bit in a hit comedy starring Paul Rudd, Leslie Mann and Megan Fox. "But it was a lot of fun." Carle, who signed as a free agent with the Lightning on July 4, 2012, was joined on-screen by fellow NHLPA members Scott Hartnell, James Van Riemsdyk and Ian Laperriere in the film written co-produced and directed by Judd Apatow. "It was a great experience," said the defenceman, who inked a six-year contract with Tampa Bay. "We filmed it in August of 2011, so it took some time to actually see it. It's a little strange to see yourself like that. We were on set for 14 hours to do our part. All the cast members were great, very nice and good to work with." Carle certainly didn't mind Laperriere stealing the scene. "They were looking for a player to take out his teeth and lucky for us, 'Lappy' was just the man they were looking for. It all worked out great. We went to the premiere in Los Angeles and had a chance to meet more people who were part of the movie." These days, Carle, who launched his NHL career in 2005-06, is hoping to play a supporting role on a team eager to shed last year's disappointing season, one that saw the Lightning fail to make the playoffs. It didn't take the native of Anchorage, Alaska very long to discover how focused the team is in turning things around this year. "I spoke to (Hall of Fame forward and Tampa GM) Steve Yzerman on the phone after I signed, as well as (head coach) Guy Boucher," offered Carle. "They made we feel very welcome from the outset. When I got to meet them in person, you could hear it in their voices, that determination to win and the disappointment of not making the playoffs one year after being a game away from making it to the finals. Those conversations really sunk in." One look at the Lightning roster also gave Carle pause for thought. "Our top six forwards are obviously extremely skilled," said the 28-year-old, of a lineup that includes Steven Stamkos, Martin St. Louis, Vincent Lecavalier and Teddy Purcell. "But then you look at our goaltenders, defence corps and other lines, all of that gives you even more reason to be optimistic." Carle is looking to slot into the d-corps in Tampa and be a catalyst to overall team success in this lockout-shortened season. "Everything, in terms of success, is measured through what the team achieves," offered Carle, who came into the year having appeared in 471 NHL regular season games. "I never really think about individual accomplishments. Just like any player, I want to improve every aspect of my game, to be a consistent contributor. But it all comes down to what the team does." While the opportunity for Carle to have a star on the Hollywood Walk of Fame won't happen, he's not about to lose any sleep. The chance to win hockey's highest team honour, however, is hardly such a longshot. And that’s just fine with Matt Carle.